Coaching a group in general can be challenging. Whether it’s a group of college kids or adults getting together after work, the logistics can be difficult. Dealing with different variables such as abilities, personalities, skills, and speed, makes it even more so. In November of 2008 I took over as head coach of the University of Colorado Triathlon Team. Going into my first team meeting I didn’t know what to expect. I had heard the team was a party team, lacking talent, discipline, and commitment to train. That sounded like just the challenge I wanted to take on! This was a completely different type of group dynamic than I was used to. However, I think the principle is the same when working with adults. It’s the camaraderie and friendship that keeps people coming back. Here are some of my tips, learned mostly by trial and error, that can help you set up a group workout in your community. Setting up a swim group is logistically the easiest group to manage. If your local pool doesn’t have a Master’s program then look to set up your own. A typical swim session is either early in the morning, around 5:30AM, or in the evening around 6PM. Swims are the easiest to keep going year round because even if it’s dark you can still swim in a pool. You’ll need to work with your local rec center officials to find out the times available. Once you have lanes reserved, promote it in the rec center, to your local triathlon club and any local triathlon or swim shops. On deck, the first step is get everyone in the right lane for the their ability. At times I had over 50 athletes at the pool so making sure everyone was in the right lane was crucial. Next, make sure there is a capable lane leader who can lead the lane and keep everyone on task. There are times you may need to spend 15 minutes with a beginner and you need to make sure the lane leaders can do their job. While structure is needed, don’t be afraid to get creative. When your team is tired and everyone’s dragging it’s OK to call it early or introduce a fun game of water polo or relay races. This helps team bonding, creates a fun atmosphere and was a staple in the early years for me at CU. This is probably the most challenging because you can’t watch everyone bike like you can while on the pool deck or at the track and it is inherently the most dangerous sport. With varying levels of ability and a group of over 20 athletes, I broke the CU team up into smaller groups- each with it’s own leader. Smaller groups are easier to manage and safer than a large group. Plus, you won’t have faster athletes waiting for the slower ones or have slower athletes working too hard just to catch up. Once again you have to rely on your team leaders to lead their pace groups. You should feel 100% confident that each leader knows the rules of the road and will ride in a safe and courteous manner. Some days I rode with the group and other days I followed them in a car. Occasionally, the entire team would ride together as a no-drop ride where one of our faster riders would lead an easy paced ride that had constant re-grouping to keep the cyclists together. Obviously, the easiest way to coach a group for riding is to have an indoor area where you can have 15 to 20 riders set up bike trainers and you can then monitor HR, hydration, effort, etc. Indoor sessions are very popular in the winter months but tend to be forgotten in the summer. Many coaches hold their run practices at a track making logistics much easier. Like the pool, you will likely have to reserve time at your local track. Talk with the officials (usually a high school administrator) to ensure you have permission to use their facility. The track was where the CU team really came together once a week for an entire workout and this can be re-created for adults too. Setting specific days and a time, like Tuesdays and Thursdays at 6AM, gives people a set time on their calendar. Early mornings are great for track workouts during the summer due to the heat. Like swimming, don’t be afraid to be creative. 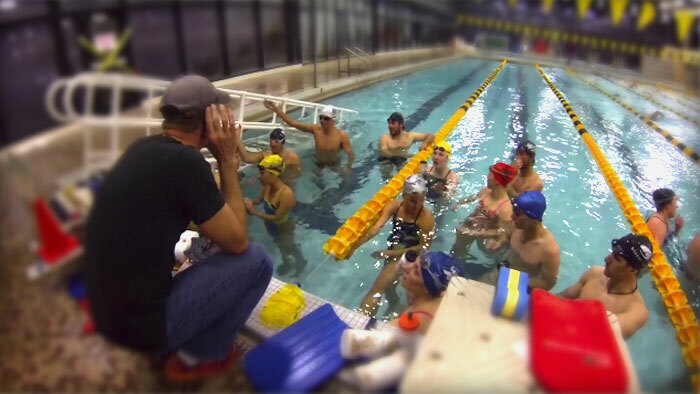 When I started the Boulder Triathlon Club track workouts the workouts themselves were challenging, but many people told me they came for the core workout that we did at the end of the session. Each week I would add in a new run drill, a new core exercise, etc. Long runs are also a good opportunity for group training. People need a little extra motivation for the long run and a group environment can provide that. Plus, the slower pace can make it a bit more conversational and social. At CU the long runs used the same A, B and C group structure since I had over 30 athletes to manage. I gave each group a time– either 70, 80 or 90 minutes for a long run. Using an out and back trail or course made organization easier. If possible, grab a small card table and place it near the halfway point to use as an aid station. The more amenities you can provide the more likely you are to be successful. Remember that practice should be fun. Build a group dynamic that others want to join. If the workout is hard but fun you will generate good word of mouth publicity and that is the best way to grow your group. People referring people is always the best way to go about getting loyal followers. Group training can take many forms and there’s no wrong way to do it. I had a friend start a group in Arkansas by going to a local hospital to advertise his group as a walk to run group for a 5k. He found cardiac patients were very interested in his group. He ended up with over 100 people in his program. Like any group, it took some time for me to get the CU athletes all on the same page. It didn’t happen overnight, but eventually the team came together and became more focused on their goal. In 2010 we won our first National Title and we have defended it successfully since then. It can be difficult to get momentum going, especially starting from scratch, but if you keep the environment fun and positive, help athletes improve their fitness and see athletes reach their goals, it can be incredibly rewarding.